Japanese authorities arrested a Chinese trawler captain September 7 and released him September 24, 2010. But since then the Japanese government has neither apologized nor offered compensation to China as the Chinese have demanded. Because the arrest took place near islands Japan considers its territory, an apology is “unthinkable,” says the Japanese prime minister. Before the captain’s release, China suspended many ties with Japan, arrested four Japanese citizens suspected of photographing military sites, and threatened to restrict shipping some rare-earth minerals to Japan that are vital to production. Reading about this incident got me thinking about apologies. I like apologizing and receiving apologies. Ideally, they’re genuine, but sometimes (rarely) they also work when the reason is more to foster good feelings than out of a deep sense of wrongdoing or regret. Whatever the motivation, however, following them with the word “but” ruins everything. The problem with Japan and China is going on right now, but sometimes apologies are demanded for things that happened before we were born. Armenia would like Turkey to apologize for the genocide (1915-23) by the Ottoman Empire, for example. Ideally, apologies should be as swift as possible or they fester. but late is better than never. If I had any ancestors who had anything to do with the African slave trade, harming American Indians, interfering with anyone’s civil rights, or involved with U.S. imperialism, I apologize. C. apologized to his younger sister for being too rough as a kid. Unlike G.’s sister, she had been longing for an apology from him. B. went to his adult children one by one to apologize for his behavior and the months he was hospitalized for bi-polar disorder when they were young. A. would always apologize two or three times to her children because she was aware that as an adult she was a such powerful figure to them. When I was around ten and my sister was around 14, sometimes I’d answer the phone and it would be a male classmate calling her. Now and then they’d assume I was my sister because our voices were similar. I would occasionally pretend to be my sister because I couldn’t resist talking to a real live boy for a minute. Though I never canceled a date or said anything untoward, I would delay calling her to the phone a bit. Later in life, she complained that this had been a serious offense. Since I felt innocent of the heinous crime she was accusing me of I resisted apologizing, but recently I tried to put myself in her place. She’s not going to read this, but if I could go backwards I would apologize because I can now see that what I thought was harmless felt threatening to her. What really matters is how she felt about it, not my intentions nor my actions. So even though my sister won’t see this, better an unseen apology than no apology at all. I might have done it. I could make it the most creative periodical ever published. I would solicit articles that would be so far out and compelling to read, the subscriptions would triple in two issues. The philosophy I espouse would be reflected in every word, at the same time as I would make sure all points of view would get equally expressed. They’d be knocking down the door to serve us with the Pulitzer Prize because of me. I followed our own advice from our book, “The Career Within You” (www.careerwithinyou.com), and measured all the parts of the editor’s job to my strengths and my needs. Yes, I could do it. Yes, I’d work hard at it. I was already thinking about whom I’d hire as the movie reviewer, the illustrator, the this, and the that. This was making me a nervous wreck and I hadn’t even made up my mind yet whether to take the job. But did I really want the job, given the other projects I’m involved in right now? Did I really want to read volumes and volumes of other people’s writing when I couldn’t even get to my top reading priorities on my desk right now? And worst of all, how many arms would I have to twist to fill an issue? How many rejections would I be able to endure? How many resources did I have to call on for material? Besides, I was beginning to realize how dreadfully my own creative writing and drawing and music commitments would suffer. This challenge would subtract from my life instead of adding to it. “The Career Within You” worked. I got my imagination into the job I was offered and went with it. I applied my best strengths and my work needs to it and came up with a worthy decision and I’m now the most relieved person I know. 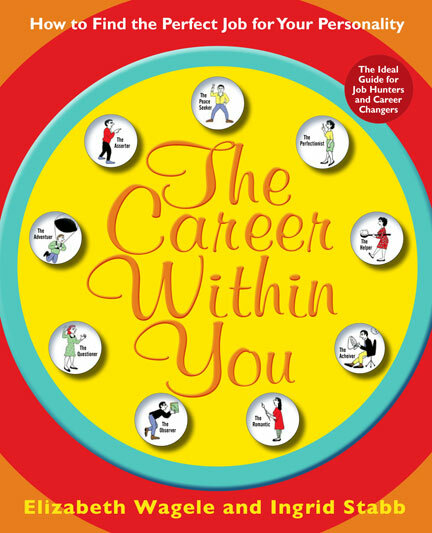 Thank you, “Career Within You.” You just saved my life. After I said “no” I started to appreciate editors more than ever. They are supermen and superwomen who can withstand colossal demands. Let me praise all editors wherever you are.